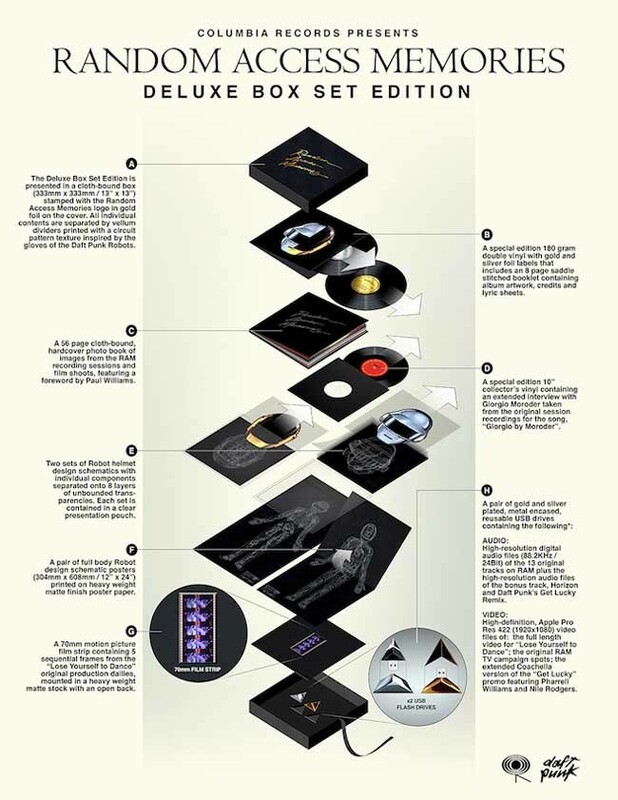 How I just found this out right now is beyond me, but Daft Punk is releasing a Random Access Memories Box set that is sure to please any and every Daft Punk fan. This was perhaps the biggest hyped album of 2013 and it crushed the charts in over 20 countries. Daft Punk helped redefine what EDM is currently by changing the sounds using different eras to make it sound complete. People like me who want to “Get Lucky” in the Daft Punk way will have to shell up $275 for the set and wait until shipping orders begin in early December. High-resolution digital audio files (88.2KHz / 24Bit) of the 13 original tracks on RAM plus the high-resolution audio files of the bonus track, Horizon and Daft Punk’s Get Lucky Remix. (Included on USB drive) special edition 180-gram double vinyl with gold and silver foil labels. Includes an 8-page saddle stitched booklet containing album artwork, credits and lyric sheets. A special edition 10″ collector’s vinyl containing an extended interview with Giorgio Moroder taken from the original session recordings for the song, “Giorgio by Moroder”. A 56 page cloth-bound, hardcover photo book of images from the RAM recording sessions and music video shoots. Foreword by Paul Williams. Two sets of Robot helmet design schematics with individual components separated onto 8 layers of unbounded transparencies. A pair of full body Robot design schematic posters (304mm x 608mm / 12″ x 24″). A 70mm motion picture filmstrip containing 5 sequential frames from the “Lose Yourself to Dance” original production dailies. A pair of gold and silver plated, metal encased, reusable USB drives.